Manokwari is a small city that is the capital of West Papua province in the Republic of Indonesia. The city is built along the Dore bay. There are a few islands in the bay. Coral reefs grow around these islands. There are also coral reef in the coastal area along the bay and in the northern region of Manokwari. A lot of species of fish is live there. For tourists who like swimming and snorkeling, Manokwari is an affordable destination. In addition of marine life, Manokwari is also a great place for visitors who are interested in exploring rainforest. There are forest areas in northern and southern regions which are the habitat of insects, birds, reptiles and mammals. One day to multiple day trips can be organized in Manokwari for visitors who want to enjoy hiking, bird and wildlife watching in the forest. To enjoy this marine sports, visitors need to bring their own gear such as mask, snorkel and fins as well as waterproof camera such as Nikon W300, or GoPro Action camera. As a tourist guide, I can organize snorkeling trips to Mansinam island, or northern and southern region of Manokwari. There are coral reef sites that are located at sea and are rarely visited by any body. 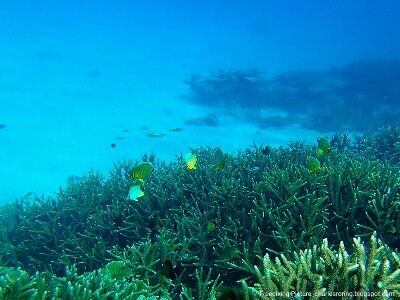 They are highly recommended sites for snorkeling. 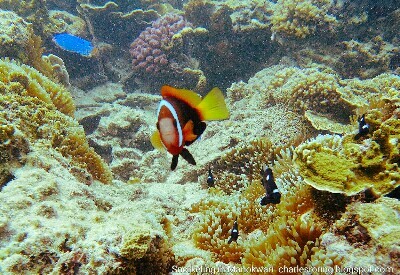 I always take pictures of coral reef and marine life when I do snorkeling and freediving. It is a fascinating moment to see various colorful fish swimming in the water peacefully. Fish such as Pink Amemonefish, Three-spots Dascyllus, Striped Surgeonfish, Snappers, Coral Breams, Anthias, Groupers, Parrotfish, and Wrasse can be seen in the waters. Practicing safe snorkeling is important. Tourists must not step on the coral or harrassing the fish and other marine creatures by touching them. I usually guide snorkeling tourists to the beach in the mornings at 07.00 and in the afternoons at 15.00. Morning time is good because the sea is clear and taking picture of the fish is easy because of the sunlight. My favorite subject is Anemone Fish. I usually have to dive closer to the anemone in order to take picture of the fish. In general, fish will come closer to us if we can maintain calm position in the water. Because I do not use scuba diving tank, bcd and breathing apparatus, I could only stay in the water for a little bit more than 1 minute. To stay calm in the water, I hold rocks with my left hand and then operate my underwater camera with my right hand.